Click here to buy tickets online up to noon Saturday or you can pay at the door. 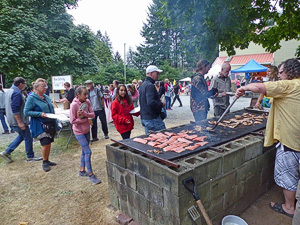 Come to one of Gabriola’s most popular annual events – The Community Hall Salmon BBQ fund raiser. 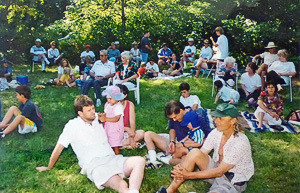 Created by about 100 volunteers, this event is an important contributor to our Community Hall. GERTIE will be running for the BBQ. 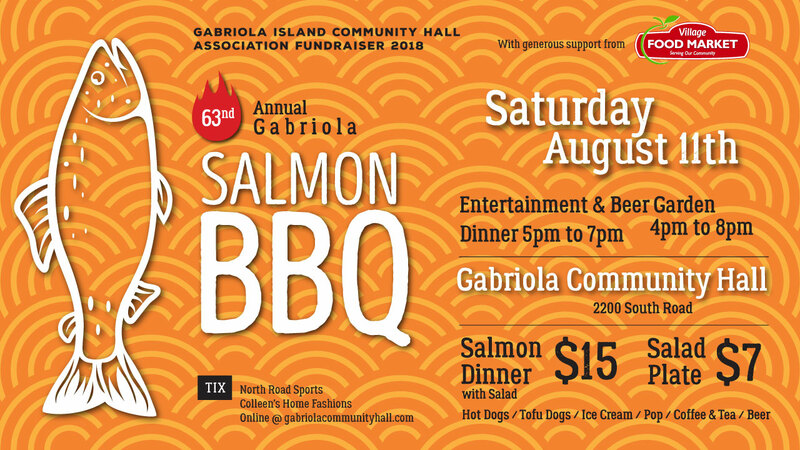 Email info@gabriolacommunityhall.com for more information on the schedule to get to the Community Hall. At the end of the event the bus will take people home to where they want to go. The bus will leave approximately 7:45 to 8 pm. You may want to bring your own chairs. Bring a cold bag and buy some cheap left-over salmon after all meals are served. Click here to buy your tickets before noon on Saturday, or pay at the door. Diners are invited to dinner by ticket number and advance buyers have opportunities for earlier service!